So to my surprise, this fruit has been mentioned around the forum but does not seem to have its own thread. I have two plants, one smaller than the other, and they have never flowered. I suspect the soil could use more acid, but I'm not sure if that is enough reason for them not to flower. I have read that they should be able to bear fruit in 1-1.5 years from seed, or at about 2ft. I would say both are about that tall, and the larger one particularly looks to me like it would be large enough to hold flowers. Apparently the flowers smell really good, as this is related to gardenia. But from what I read it tends to flower and fruit in Winter-Spring, and here that is the dry season - would this indicate it prefers LESS water to flower and set fruit? Or does it need MORE? Apparently it is native to Central and South America, and is tropical-subtropical. It supposedly does not need direct sunlight, and can fruit in filtered light. I hope that is true, because I have mine planted in filtered light. And they seem to be growing just fine, and are producing more leaves - they're just not doing anything else yet. Maybe I have to wait a whole year more for them to develop some more? Anyone out there have experience with Blackberry jam fruit/Randia formosa, have pictures to share with us, or experience tasting the fruit to share? Suggestions on what this needs to flower, and/or fruit? Anyone have them flower in late Spring or another "off" time? I have one that flowered in a 7 gal but did not produce fruit. It was about 5 ft tall by 6 ft wide and well rooted into the limestone gravel that is under my potted plants. I recently ripped/cut it out of the ground and planted it in the section of my yard that is the classic West Broward muck around 3 weeks ago. It lost all its leaves but it is currently sending out new leaves from every node and seems to be recovering without any branch dieback. I have never tasted the fruit. Thanks, it's good to hear another experience! Maybe someone will say something on this thread that will help you find a way to get that thing to fruit! Do you have more than one plant, though? I have read online both that they need more than one plant for pollination, and that they are self-pollinating. Can anyone with experience growing these clarify which is correct? From what I read, many max out at 4-5ft tall, so yours should be more than big enough to hold fruit. I'm glad moving it didn't seem to kill it, because that would have been a shame. I have read differing reports on the fruit, too, that some love it, while others find it to be poor quality and to have too many seeds. I wonder if this is an individual taste thing, or if they might vary by plant or growing condition, as so many fruits do. Unfortunately I dont remember the time of year I saw/ate the rpie fruit. They fruit almost year round here. The taste is very nice, really like the name suggests, but it is very seedy and the fruits are small. It's mostly a kiddie fruit. The soil here is about pH 6.5, so it does not need very acid soil. OMG!!! So, I was talking to my neighbor over the fence yesterday, and I looked down, and there on the larger Randia formosa (which has been in-ground for at least 2 years, and is the only one of the two so far to flower) was a fruit!!! *My question is, when should I harvest it? It is very tiny... like maybe 1.5 cm long? But it is yellowish, like pictures I have seen... does that mean it's ready? When I touched it, it seemed firm, so did not give any clue as to ripeness that way, and did not ready fall off the branch by being held. For the info of others here, I have 2 plants side-by-side - maybe a year younger and about half the size of the other. The larger one has only ever produced a single flower, that I have seen, and I do look over all my plants regularly. The flower was large, white, flat, and beautifully fragrant. It had no visible pollen. So I am really baffled how this plant could have made a fruit... I never saw even a single flower this year! The single flower I had, came I think around May or so of last year on the larger plant. (Don't remember... I wrote it in another thread though, maybe the one about waiting so long...). So is this plant one of those that can produce fruit apparently without multiple flowering plants, and also even without multiple flowers on the SAME plant? The fruit is down low a bit underneath the plant near the ground, so I can see how I would have missed the flower. But I wonder how long it was there before it created the fruit, and if in fact there never was another flower to pollinate...? Anyway, this is amazing news for me. Especially after so many plants have yet to produce anything, and then the 3 natal plums flower profusely but have not made a single fruit, I have been getting very frustrated. Natal plum are similar with a white fragrant flower, and no visible pollen. Like Randia formosa, it is another species that has variable taste quality depending on the plant. I am really hoping this particular Randia turns out to have good flavor. From everything I have read, it sounds like it is highly variable, with some people having really great flavor, and some poor. I have not seen clear notes as to whether this is more a function of the soil and/or climate, or just the individual plant. Possibly some of both.. I was expecting the fruit to be much bigger though... not the size of a fingertip. Do they keep growing? Or once they turn yellowish, is that it? Yes, the color says it all with this fruit. I have never picked a yellow one that was no sweet. It's a great novelty fruit and always has something, nice when walking people around that don't know the fruits. It can make a pretty good hedge too, in my opinion. The large white flowers are attractive. I have a couple small seedlings. I lost the rest to heat. cries* I was thrilled to hear how little time it takes for them to fruit. I wouldn't care if they were seedy or small. As long as the flavor is good, I'm in! Thanks - once it's yellowish, is it done growing? Because this thing is so tiny, it's sad to pick it already - I'd be happy to wait if it could get any bigger. Also, it is hard to the touch - is that normal for a ripe fruit? It's good to pick when it turns yellow. Like posts above, it is quite tasty but very scant 'pulp' and lots of seeds! I consider this one of those novelty fruits (like peanut butter fruit, and others). Its fun to try the first time and occasionally, not something to grow for any commercial activity or for food sustainability. Its more reserved for just tasting. A few of us have noticed they like to be fed, and there may be an increase in production with the addition of biochar. More to be explored later. They have a brittle skin, so never get soft. Yellow = ripe. Yours sounds a lot smaller than usual. They will get larger as plant gets bigger. For those who were wondering, I did break open the Blackberry Jan fruit. There was no moisture inside! Just about 8 seeds - much larger than I expected, close to a small passionfruit seed in size - and no fruit at all. I tried sucking the seeds, because there was some dark residue on them, but I tasted nothing at all. So maybe that fruit was on there a lot longer than I thought it was, and I just never saw it. Ah well. Hopefully there will be a lot more fruits in future, and that they will get bigger. If I'm lucky, one of the seeds will be mature enough to start a seedling. It was not at all easy to get the fruit off the branch - it really did not want to let go, hence why I thought it was still growing. I suppose that could be another reason for what I found inside, that it wasn't ready, but if so I'm surprised at the relatively large size of the seeds. I had assumed they would be tiny, like raspberry seeds or strawberry seeds or something. The seeds you might find in jam, I guess. But no, they're large enough to easily pick out and count. According to Helton Muniz the blackberry jam fruit (R. formosum) is hardy to -4C (25F), however this has not been my experience. Anyone in a cold climate able to confirm? While we're on the topic of randias, has anyone actually tried the fruit of R. ruiziana? According to Helton, the fruits are tasty and taste like dark chocolate with roasted peanuts, but colour me skeptical. Also on the topic of Randias, I collected Randia megacarpa from the mountains of Sierra de la laguna in S Baja, CA. Fruit is eaten by locals and about the size and shape of a fig. The ones I ate were tasty, black in color inside. Locals call it "papache". It is growing here in central CA, about 4 ft in height, never flowered or set fruit, so am still waiting. Has anyone fruited this one? How would you describe the taste? How was the seed/flesh ratio? Searching through TFF history, you're the only one I see growing R. megacarpa (aka. R. capitata, which is the accepted name). And yes, I searched for R. capitata as well Haven't searched for the other synonyms: R. ehrenbergii, R. purpusii, R. tomentosa, R. watsonii, and Solena capitata. While you are verifying this particular Randia (megacarpa), you might also look at Randia armata and Randia obcordata, both of which also occur in Baja California and one also from Oaxaca down to South America. Randia megacarpa (The specific epithet megacarpa is from the Greek meaning "large fruit" - which does apply to this Randia). This particular R. megacarpa occurs in a very small area of Baja Ca. from Comondu to the Cape region. It is endemic to the mountainous area and quite popular with the locals who refer to it as "Papache". Papache is also used to refer to at least one of the other Randias. 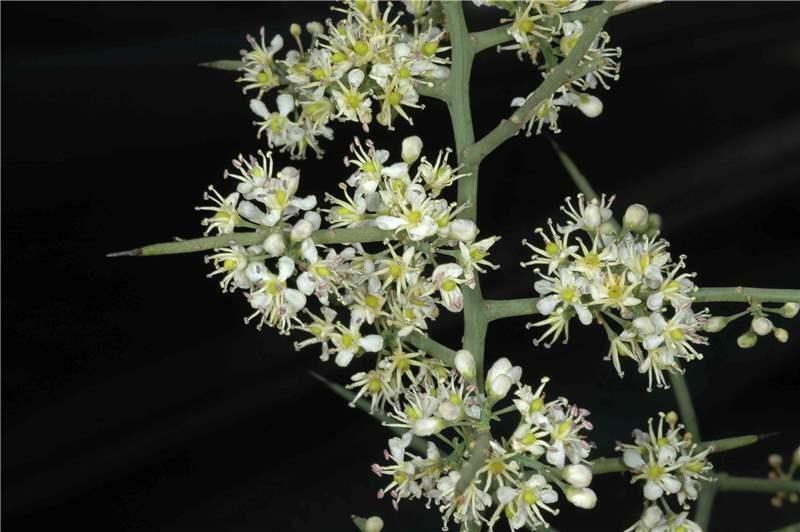 Local folks living in the mountainous areas have many relatively uncommon endemic fruits like Sapotaceae, ciruelo, and 5 different passifloras ranging from a 1.5 cm flower to a 10 cm one. All produce fruit, some of which is not agreeable. Flavor of this Randia fruit is sweet and pleasant, quite different from other fruits. Dark black inside the fig-like fruit. Many seeds are part of the rather generous pulp, yet still a popular fruit. Hopefully this year this plant will flower and produce fruit here in the central coast. Blackberry jam fruit can can grow larger than I expected. The one in this video looks to be about 15 foot. Mine is only 8-9 feet tall and is quite old. Might be different versions of it, some getting bigger than others, some tasting better than others. Height might also have to do with ideal climate and soil conditions? from my own experience, from the 5 bushes I have, grown from seeds, they started flowering at 2years but fruiting only at 3 years. So you should get fruits next time they will flower. They are very decorative, flowers smell really nice and fruits are lovely. It is tasty but not so much flesh, too many seeds and often difficult to open without making a mess.